Succeeding the vastly successful NF-S12, the NF-S12B is a next generation quiet fan featuring Noctua's advanced SCD2 technology as well as a highly optimised blade geometry with Bevelled Blade Tips that improves its award-winning predecessor's airflow efficiency by up to 10%. Topped off with Noctua's time-tested SSO-Bearing, 6 years warranty and versatile 1200/900/600 rpm speed settings, the NF-S12B FLX is a premium quality fan that offers full flexibility in quiet to ultra-quiet case cooling. 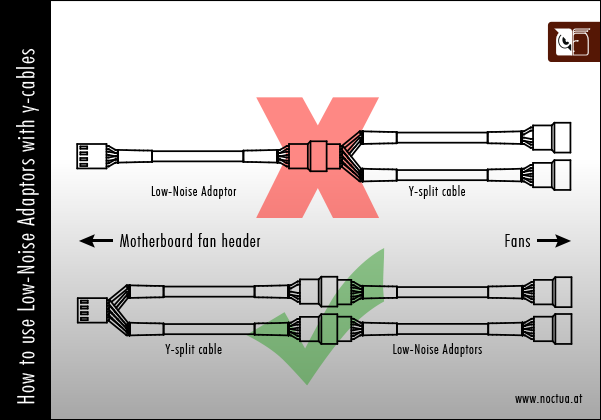 Which fan is right for me? Thanks to its further refined blade geometry with extended leading edges and Bevelled Blade Tips, the NF-S12B achieves up to 10% more airflow and static pressure than its much acclaimed predecessor at the same noise level. Providing 1200, 900 and 600 rpm speed settings via the supplied Low-Noise and Ultra-Low-Noise Adapters, the FLX (Flexibility) version can be fine-tuned for superior airflow or maximum quietness. The latest version of Noctua's advanced SCD drive system ensures superb running smoothness by eliminating torque variations and switching noises. Noctua's time-tested SSO-Bearing technology has become synonymous with supremely quiet operation and exceptional long-term stability. Noctua has made another very nice fan. The Noctua NF-S12B FLX fans are insanely quiet while moving a fair amount of air; aside from the color [...], I have nothing bad to say about the fans. Since we first reviewed a Noctua product they have gotten much more popular and have become one of the leaders in ultra low noise fans. Les résultats sont sans appel. Les tests ont même été refaits une seconde fois pour bien confirmer ces différences de température. L'avantage est clairement du côté du NF-S12B FLX, qui offre un flux d'air impressionnant , même à 1000 tpm. [...] Voici les spectres d'enregistrement des modèles de marque en présence, sachant que le ventilateur Noname (sans marque) fait un "cliquetis " absolument insupportable, le disqualifiant avant même la compétition. En bas, on retrouve les basses fréquences, le spectre est croissant du bleu clair au rouge vif, en passant par le bleu foncé et le rose. On voit ici clairement qu'à 1000 tpm, le S12B est clairement plus silencieux. A 1300 tpm, il est audible, mais avec un bruit finalement plus diffus que celui du Xigmatek à 1000 tpm, qui est finalement plus audible avec bruit plus concentré dans les basses fréquences. The results speak for themselves, the S12B clearly shows some improvements over the original S12 fan. This bevel obviously supports this progression. I was surprised to see that the temperatures on the CPU side also dropped lower, I didn’t expect this. The S12B has some great air pressure performance and this shows in these results as the fan draws even more heat off the CPU heatsink also. [...] Whilst the S12B does perform by giving us those reduced temperatures, it also delivers on the audible side of things too. The S12B is whisper quiet with the adaptor kits and even at the full speed of 1200RPM it isn't much bother and will not disturb most. So you probably want to know how the NF-S12B performed in our tests. We can certainly testify for its quietness. Listen to this sample clip recorded with a high quality mic placed four inches away with the fan running at its maximum rpm of 1200rpm. [T]he NF-S12B is an extremely quiet fan, even at its maximum rpm. Noctua, yet again, have been able to come up with a top quality product that pretty much excels in all departments. 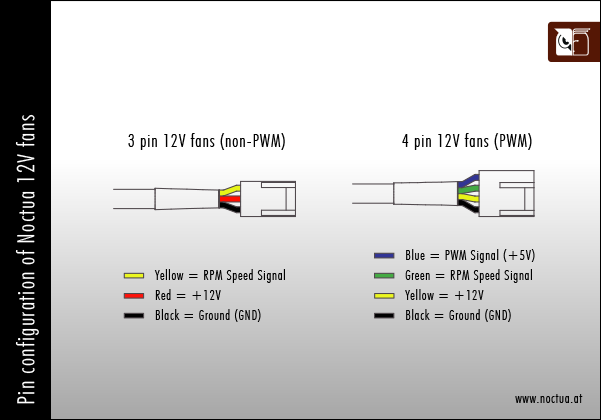 The airflow to noise ratio is awesome and this added airflow allows the fan to beat the likes of the NF-P12 and the Noiseblocker Multiframe series. Amazingly, despite the increased airflow, the noise has actually decreased making the fan virtually inaudible especially using the noise adapters that allow awesome flexibility for the user. Kalbant apie ventiliatorių dizainą, Noctua spalvos vienas dviprasmikiausių klausimų kompiuterių rinkoje. Vieni jas dievina ir vien tą spalvą laiko aukčiausios kokybės etalonu, kiti negali perneti. Ar jų dizainas yra gėris, ar blogis paliksiu nuspręsti kiekvienam. Komplektacija tikrai diugina. Yra viskas ko reikia ir dar truputis. O pridedami priedai stebina ne vien kiekybe, bet ir kokybe. Pats ventiliatorius pasiymi puikiu perneamo oro bei triukmo santykiu, kas ir yra svarbiausia renkantis tokį gaminį. Net ir naudojant Neblogą vidutinės klasės Enermax ETS T40 TA auintuvą bei Intel Core i5 2500K @ 4.5 GHz procesorių didelio skirtumo tarp pigesnio ventiliatoriaus nepajautėme. Bet jei naudotume daugiau karčio ventiliatoriams teikiančią sistemą skirtumas ikart irykėtų. Aiku, kitas ventiliatorius skleidė didesnį triukmą. Be to galingą ventiliatorių sukonstruoti didelio proto nereikia, o va galingą ir tylų - ne kiekvienas gali. Panai situacija yra ir su dviejų tokių ventiliatorių naudojimu, kai sistema jų neinaudojo. Atsiras sakančių, kad mokėti 80 litų u ventiliatorių nėra verta. Su jais visikai nesutinku. Nė vienas pigesnis gaminys nepasiūlys tokių gerų tylos ir oro pralaidumo sąlygų, kas yra svarbu daug ventiliatorių turinčioms entuziastų sistemoms. Tačiau reikia turėti pakankamai stipriai kaistančią sistemą, kad pajaustumėt io gaminio privalumus. Be to bėgant laikui investicija bent i dalies atsipirks - pigiųjų ventiliatorių guoliai sueina" labai danai, ir kartais juos tenka keis vos ne kiekvienais metais. iems ventiliatoriams tai negresia - jų gyvybingumo laikas didelis, be to suteikiama net eių metų garantija. Coming in, I expected a certain level of quality and performance from these fans. I mean after all, they ARE Noctua fans. What I got in return is exactly what I wanted — fans that keep everything in my PC extremely cool without making a bunch of noise. In fact, I use all four fans without any of the Low Noise Adapters, and I can’t even hear them. All you can hear is the air rushing through the side panel, which happens to be a foot away from me, on my desk. Como se puede ver, en IDLE no hubo mayor diferencia, sin embargo cuando el procesador recibía carga, el Noctua a 1200 RPM era capaz de rivalizar con el ventilador stock del TT Contac 30. Las velocidades 900 y 600 RPM son de muy baja sonoridad, sin embargo sacrifican el caudal de aire que entregan, lo que implica que las temperaturas de operación son mayores tal como se observa. Acá vemos el Delta de temperatura, el cual es la diferencia entre la temperatura ambiente (16,5°C) y la temperatura de operación. A menor Delta T°, mejor capacidad refrigerante. Se vuelve a corroborar que a 1200 RPM, el Noctua NF-S12B FLX es capaz de entregar un excelente caudal de aire y con baja sonoridad. Pero si usamos los adaptadores para bajar aun más el ruido, estaremos sacrificando temperaturas. Ein Noctua Produkt muss sich immer hohen Erwartungen stellen und in der Regel wird man auch nicht enttäuscht. Eine hervorragende Verarbeitung, viel brauchbares Zubehör und eine niedrige Lautstärke. Diese Eindrücke bleiben bei uns nach diesem Test im Gedächtnis hängen. Lediglich der Preis von durchschnittlich 17€ schränkt das Produkt auf einen enthusiastischen Käuferkreis ein. Aber wenn man die 6 Jahre Garantie betrachtet, den überkompletten Lieferumfang und wie viele Lüfter bei mir schon nach 2 Jahren das zeitliche gesegnet haben (meist Lagerschaden), wäre dies wiederum eine günstigere Option. Qualität hat nun mal ihren Preis. Lieber einmal tiefer in die Tasche greifen und für lange Zeit 'Ruhe' haben [...]. I've got 2 adapter cables with the cooler. What's the difference between these cables? My fan doesn’t spin when I start up the PC - is it faulty? The fan doesn’t start with the Ultra-Low-Noise Adaptor (ULNA)! 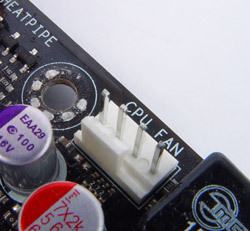 If you've connected the fan directly (or using the supplied Low-Noise or Ultra-Low-Noise-Adaptors) to your mainboard, it's possible that the mainboard's automatic fan controller doesn't provide the required starting voltage due to the low CPU temperature. Please verify whether the fan starts spinning at higher CPU temperatures, remove any Low-Noise or Ultra-Low-Noise Adaptors, deactivate your mainboard's automatic fan controller in the BIOS or connect the fan directly to the power supply using the supplied 3:4-pin adaptor. Unfortunately, many Gigabyte mainboards use a special control circuit that can lead to start-up problems in conjunction with the Ultra-Low-Noise Adaptor (ULNA). 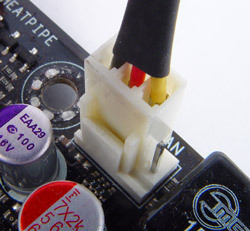 This control circuit remains active even when automatic fan control is disabled in the BIOS. In these cases, please use the fan without the ULNA or connect it directly to the power supply (or an external fan controller) in order to ensure reliable operation with the ULNA.